Vaporesso are back in the pod market with a rather unique design that is bound to appeal to people. However does the Aurora play provide the spark to ignite the pod systems or has it ran out of fuel well before usage? Vaporesso it has to be said a re very good company within the industry. 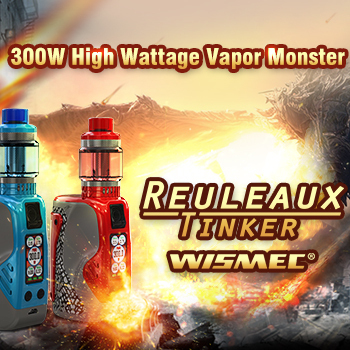 They offer very reliable devices and have proven to be really popular with vapers of all experience levels. The recent SKRR tank brought a fantastic stand alone sub ohm tank so next up is the pod market and the Aurora Play. 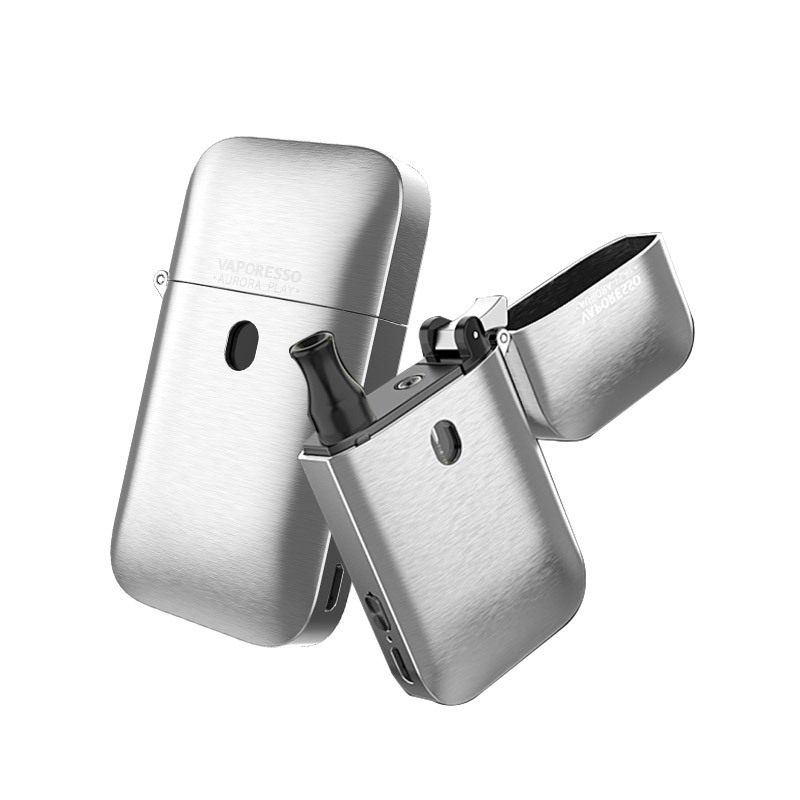 What makes this pod system stand out from the rest however is the Zippo style lighter body which certainly doesn’t look like most other pods on the market today. It is all well and good having a nice design but does it perform as well? Before we get into all of that, let’s go through the details first. 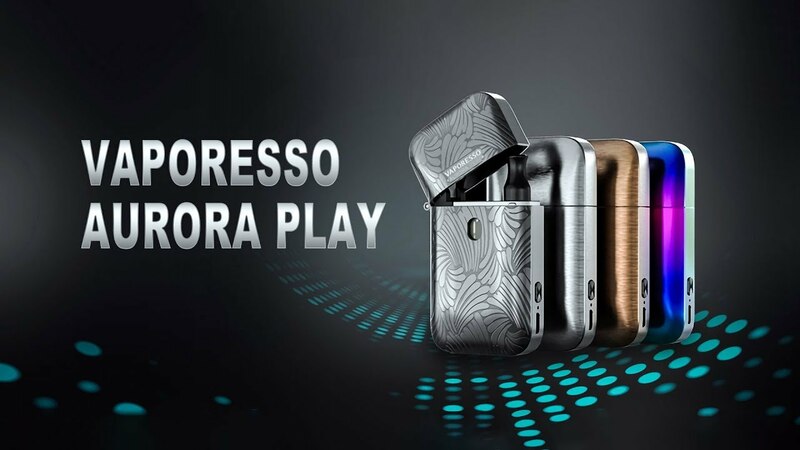 The Aurora play is the latest pod system from Vaporesso offering a high quality vape and a unique lighter style design. 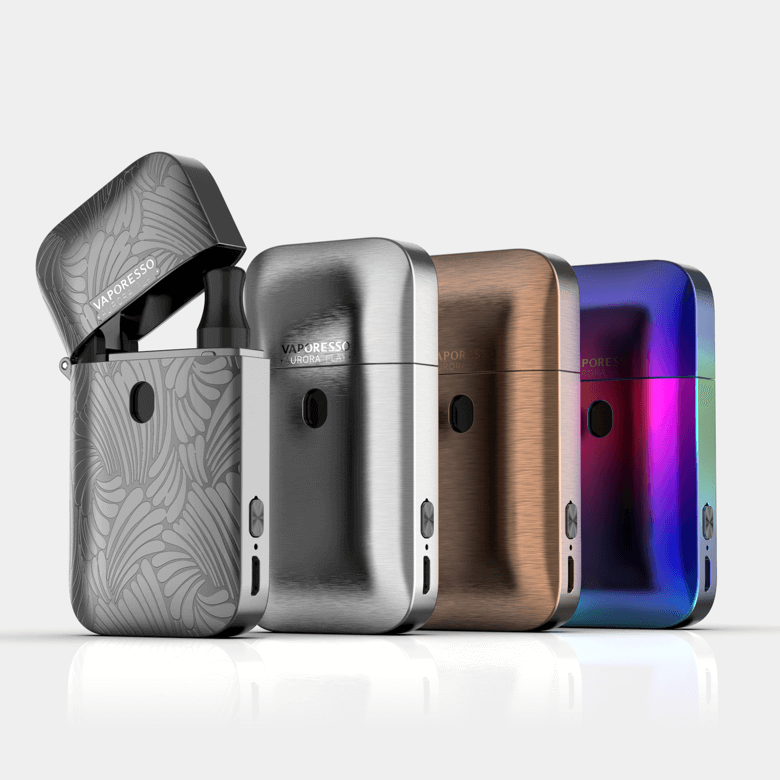 The pod is a 650 mAh internal battery device pod housed in a metallic lighter style body combined with spring loaded flip top. The Aurora play is an auto air draw system with no button required to fire. The device comes with back USB charging port and on/off button as standard. Charging time for the device via USB port is around 60 minutes and is indicated by a range of colour lights from red (low) to green (50%) to blue (70% plus). 3 clicks alters the power modes on the device between 9w-12.5w and 5 clicks turns the device off. The pods themselves are 2mil capacity and 1.3 ohm resistance coils inside. The shape of the pods are essentially inserts into the top of the pod body so come with an almost rectangle shape design. The pods have a top push to fill design rather than a separate silicone bung which means filling the device can be done without removing the pod. The pod comes with a small 510 non standard drip tip on top which can be removed but won’t house standard drip tips on top. There is a fill window on the device also which allows you to see when to refill the pod. The first thing to really talk about with the Aurora play is the design of it, how protected it really is. Looking beyond simply the style of the device, the flip top provides pod security and the on/off button prevents any accidental draws, despite how unlikely that would be. Housed in a metallic body, it means the device will survive any accidental drops and the brushed metal style can survive general wear and tear. The battery life at 650 mAh isn’t the biggest but I found it to last all day when using it as intended and the charge time is quite reasonable considering the battery capacity. 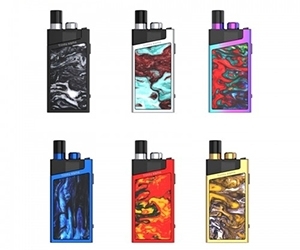 The device is rather straightforward to use with no real options other than the slight power mode changes which makes it quite accessible for new vapers as well as experienced ones. The flavour from the pods is really nice, a very strong flavour comes through with a nice amount of vapour production also. Better suited to more simple flavours, the coil does provide a nice vape and throat hit even with using nicotine salts. Wicking on the coils is not a problem and it will keep up when chain vaping so a huge plus point there as well. The fill mechanism is nice and simple with no bubbling inside the pod and again very simple to use. The easy to replace pods is a nice addition especially when they can sit in there until change is required. The final pro is going to be the 2 coils provided in the box, always great to see that over the usual one pod boxes. The first con for the device itself is going to be the lack of difference between the power modes. Considering the 3w difference in them, I didn’t really notice an awful lot more powerful in any of the modes. This is a con for me because it may have been better kept as a simple one power mode only for ease of use. 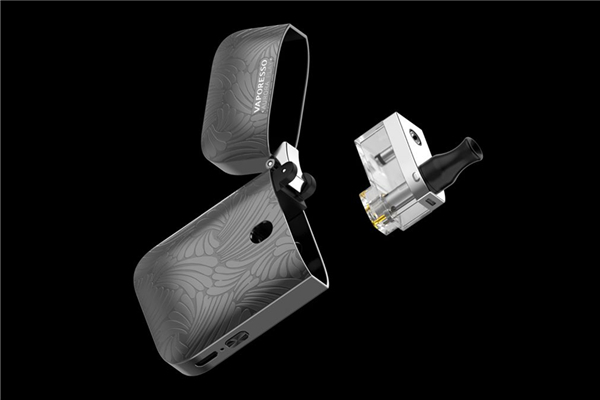 The design of the device may not appeal to everyone and certainly not anyone who wants to distance themselves from smoking so that is worth mentioning also. For the pods, the only real con I can find with them is to do with the fill hole. Although easy to use, I does require a little bit of pressure to activate and it won’t be suitable for any dropper or wide needled bottles which limits how you can refill the pod. At a push, the fact the pod does not house standard 510 drip tips is going to be a con for a select few but I wouldn’t call that a real con for the device itself. Given its unique the design, with the company making it, the Aurora Play is a very solid pod system on the market now. Providing a very nice low powered MTL vape , sturdy body and efficient battery life, the Aurora play could well be a big hit with vapers. 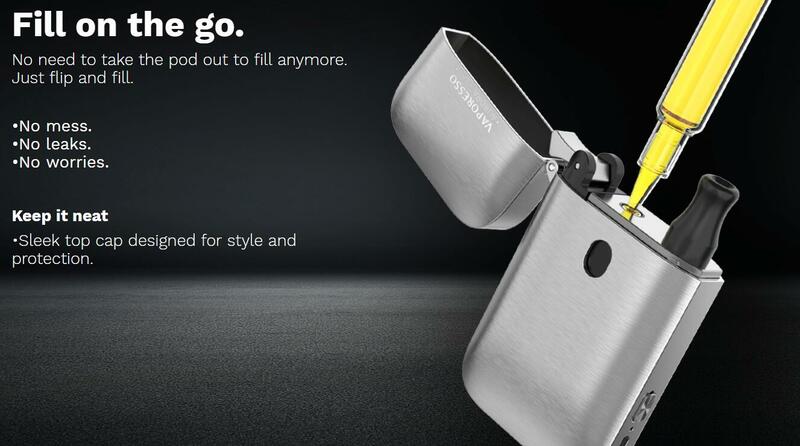 The design itself may not appeal to everyone, I can see a massive draw for smokers looking to move into vaping as a way to replace their trusty Zippo lighter and give up at the same time. Vaporesso continue to provide their high quality products and the Aurora play is potentially a bright light in the muddled darkness of the pod system market. The Aurora play offers a unique lighter esq design but matches it with a solid vape experience as well. 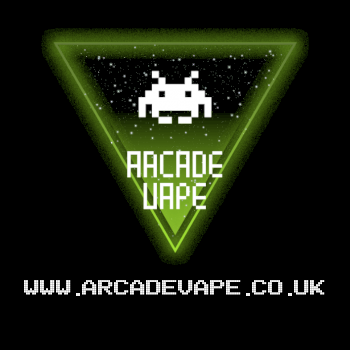 The Aurora play offers good flavour, pod life and vapour production and it is sure to appeal to new vapers. 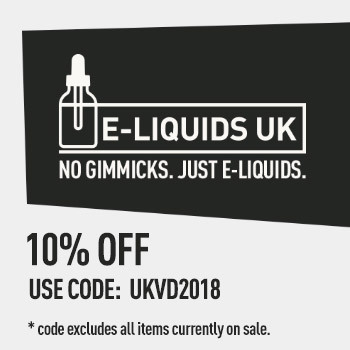 What is UK Vape Deals ? 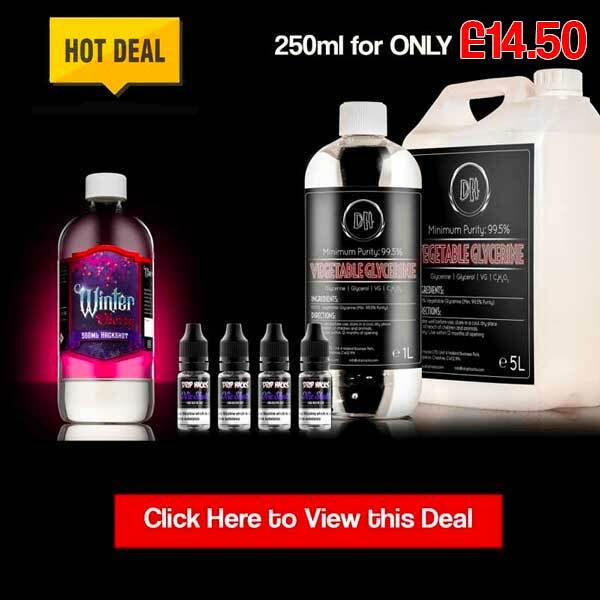 UK Vape Deals is the biggest UK Vaping deals blog website where the public find and list the cheapest & best Vape Deals, discount codes and vouchers for E-Liquid and vape products for April, 2019 from around the UK. All the latest vaping deals in one place. UK Vape Deals does not sell products direct, each product is sold by various businesses that offer exclusive and non-exclusive deals. Please click on links at your own risk. Come and grab some Vape Bargains today. 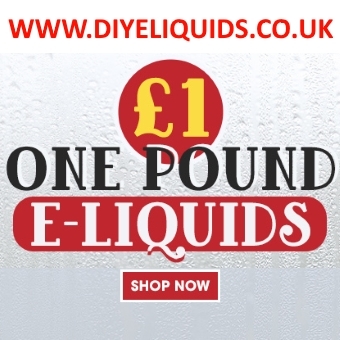 © 2018 UK Vape Deals All rights reserved. 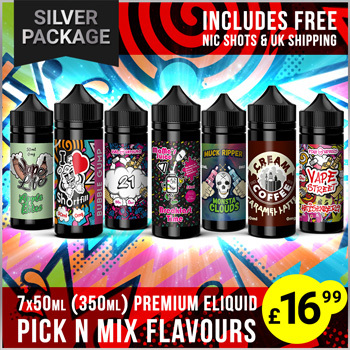 You must be over 18 to view UK Vape Deals. All product names, logos, and brands are property of their respective owners. All company, product and service names used in this website are for identification purposes only. Use of these names, logos, and brands does not imply endorsement.